One of the most common indoor plants is the peace lily (or Spath to us in the floral industry.) Chances are if you have several indoor plants, one of these are in your arsenal. They are very common to receive from a funeral service or as an easy care gift, so it's probably one of the most common plants to find in somebody's home or at the office. So how do you care for a peace lily? Easy...just add water. And lots of it. Peace lilies are almost always thirsty. The solution is simple. Put a deep tray underneath and add water every few days to the tray and let it drink up from the bottom. The reason to water from the bottom is that if you continually pour water on top of the plant, it will form black spots on the leaves. Always add water in the tray and allow the roots to soak up from below. If you have gone too long without watering, your peace lily will let you know. Like a 13 year old girl, they are very dramatic when they are unhappy. They are quick to droop their leaves, but will come back within a few hours after watering. Just don't get too comfortable with the cycle of: droop, water, droop, water, etc. After some time the peace lily will start to show the stress in its leaves. It's best to just add water to the tray in advance. They can take a lot of water but will run through it in a matter of days. 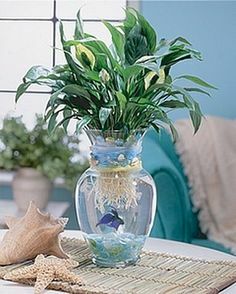 We even had a peace lily stuck in a vase with a beta fish that our kids won at the local pet shop. Yes, it survived with no soil and only sitting in water. Its roots drew nutrients from the water like a hydroponic system that benefitted both plant and animal, and more remarkably is the beta fish lived for 3 years! The other thing to remember about peace lilies is that they like low light. Indirect sunlight is best otherwise the leaves will yellow from over exposure. Remember to fertilize your peace lily about once a month with our Beat Your Neighbor fertilizer. As your peace lily grows, it will become root bound and need to be repotted. You will probably see the bright white roots starting to stick out from any holes in the pot and by the faster time that your plant consumes the moisture. Simply pop the plant into a larger container (that has holes in the bottom to draw up from the watering tray) and add a good quality soil around the now exposed roots. We recommend a soil like Metro-Mix 360 because it is a high grade growing soil. Just stay away from anything you find in the big box stores, especially the cheap national brands. Go to your local garden center and use what they are using. Our newsletter contains great tips and tricks, how-to videos and very often we will give out promo codes and special offers.